An article about Freemasonry has been published on BBC News' site and seems to once again show cracked certain members of the British public really are about our Fraternity. The article by Tom de Castella is entitled, Would You Want to Be a Freemason? Dogged by conspiracy theories, Freemasons insist theirs is a modern, open organisation. But can this male-dominated body cast off its secretive image and win over a sceptical public? They designed the pyramids, plotted the French Revolution and are keeping the flame alive for the Knights Templar. These are just some of the wilder theories about the Freemasons. Today they are associated with secret handshakes and alleged corruption in the police and judiciary. But dogged by this "secret society" image, the Freemasons have launched a rebranding exercise. 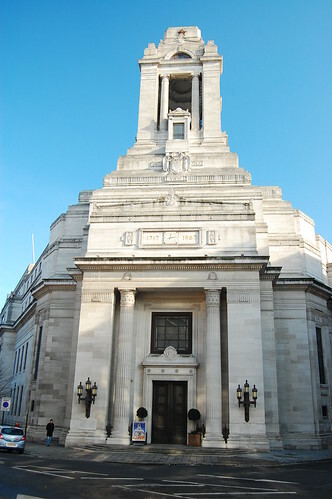 On Friday, the United Grand Lodge of England, the largest Masonic group in Britain, publishes its first independent report. The Future of Freemasonry, researched by the Social Issues Research Centre, aims to start an "open and transparent" discussion ahead of the group's tercentenary in 2017. I'm always shocked by the glib titles in articles about Freemasonry in England. "Would You Want to Be a Freemason?" The editor might as well have said, "Would You Want to Get Cancer?" The article starts at a point of distrust and surprising, ends the same way. Let me put forward an argument that you can either take or leave at your discretion. I wonder if, because we are a Fraternity that teaches "a course of moral instruction, veiled in allegory, and illustrated by symbols", we cause people to feel uneasy. It's not uneasiness because of our symbols or our allegories but because we teach morality. We live in a society of ad men who tell us that we're so bad, we need to be repaired, not improved, repaired like broken toys. We seek to feel good and make stupid choices to arrive at that "good feeling." Masonry doesn't make you feel bad. As you progress through the degrees, you see a support system, a structure that will help you make good choices in your life. As someone who was a goody two-shoes, I can tell you that it's hard and you need positive role models to go against the Jersey Shore mentality. (Wow, do I ever sound like Tony Robbins) Perhaps the public sees this as a problem, that we are acting "too good." If that's the case, I won't apologize. Masonry gives my life supplemental meaning and value after my true happiness of being a good father and husband. Why should we apologize for giving men a mooring against this storm of hostility? I think the brand consultant makes a good point and one that American Masons won't quite understand, including myself, "[p]eople join the Masons not because it is a community group raising money for charity but for its "snob factor" and history." I think he's right. There is something elite about being a Freemason. I'm shocked that conspiracy theorists are given an equal footing with Freemasons in any of these news articles. An article like this begs the question, what is our duty to the public concerning our internal activities? The public will believe what they want to believe and we will have to live with that like we have for hundreds of years. Men will find our lantern hanging on the Temple's portico. They will see the light to give them the tools for self improvement and happiness. They will find us. Looking for approval or going up against conspiracy theorists only leads to wasted time and effort. We are who we are and we should be proud of that. Should we go up against the pressures of society? How best can our Fraternity deal with scrutiny? Leave a comment below. I thought the article was idiotic. The most disturbing thing about Freemasonry the reporter discovered was that we roll up our trouser legs. That really upset him. The British tabloids write articles like this all the time, but it is disappointing to see the BBC stoop to this level of non-journalism. If this clown wanted to understand the Freemasonry in England, he need not have looked any farther than Bernard Jones' book, "Freemason's Guide and Compendium" for answers. Instead, he provides evidence more spurious than the Monty Python sketch "How to spot a Freemason". Pathetic. It would be nice if anyone would write a serious article about Masonry without bringing up, even in a joking sense, the conspiracies. Do journalists bring up 'Loose Change' in every article about 9/11? No. Because they take the topic seriously. Journalists don't take Masonry seriously. Maybe it's a political thing. Maybe Mason's just aren't relevant enough anymore. But I think this is a thing where the old adage "any publicity is good publicity" isn't useful. Mocking publicity is ultimately the most undermining. I'd prefer people attack masonry than goof on it, but whatever. In a way, Mason's have it coming, because we're not putting our best foot forward, really. Who can be expected to take us seriously when we don't take ourselves seriously? We claim to take good men and make them better; then we rush them through the degrees and off to the Shrine or the rites without teaching them to be masons. We raise hundreds of men each year who cannot work as a master mason nor can they prove themselves to be one. We tell the candidate we are offering them the highest of honors but we will confer them on any man whose only qualification is a pulse and a check. We should not be worrying about what others think of us; we need to seriously contemplate what we think of ourselves! I think that the reason Americans don't see Freemasonry as being elitist (at least, not to the degree seen in the UK) is because we haven't had our own Profumo scandal. In the US, Freemasons (at least here in New England) are still seen as those nice, older guys. "Oh, my grandfather used to be one, I think" is still one of the first things I hear people say. Nostalgia: Is It Useful in Masonry?